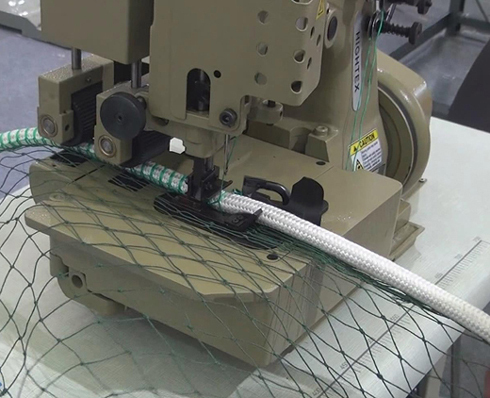 Industrial rope netting sewing machines for attaching rope to netting, attaching a tape border to any net, joining nets together, and serging / overlocking the edge of netting. We have prepared our sewing equipment to sew sports, safety, cargo, fishing, laundry bag, and mosquito nets. Why Hightex Netting Sewing Machines? Our sewing equipment are affordably priced, provide a lifetime of reliable sewing, and require minimal part replacement. Hightex 81500CZ is single needle three thread overedging sewing machine perfect for attaching ropes to net borders: It can sew up to 20 mm thick ropes (diameter). It is the latest sewing technology in this field, standard equipped with strong puller feeding system, max. sewing thickness is up to 25 mm (= rope diameter + thickness of netting). This machine can replace Union Special 81500CZ3374A and Union Special 81500CZ3374B. Hightex HR-4N Net sewing machine for attaching rope to netting: This net overedging sewing machine is used for all seams of medium thickness from 3 to 10/12 mm, for example the edge of both single and double, knotted and unknotted netting, and the edge of netting and rope etc. This machine can replace Newlong HR-4N, max. sewing thickness is 14 mm (= rope diameter + thickness of netting). Hightex 9204ZZ heavy duty walking foot zigzag sewing machine for attaching rope to netting, netting to netting and net overedging etc: Ideal for manufacturing fishing nets, sports nets, cargo nets, safety nets, agriculture nets. Powerful walking foot mechanism insures the smooth feeding of hard-to-feed materials or multi-layered sections of materials to achieve consistent seam quality that is free from irregular stitch pitches. 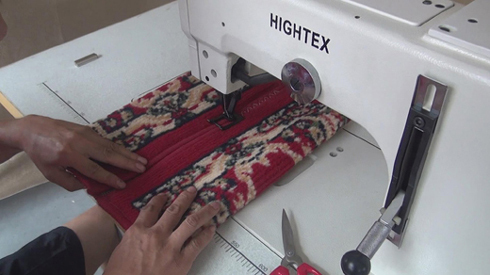 Note: the zigzag lockstitch is safety stitch compare to regular overlock stitching machine. Hightex 9204ZZ Heavy duty walking foot Zig Zag sewing machine for carpets, rugs and floor mats: The Zig-Zag Width (up to 16 mm) is bigger than any other industrial zigzag sewing machine built today,ideal for assembling (jointing) 2 pieces of carpets together by stitching. Powerful walking foot mechanism insures the smooth feeding of hard-to-feed materials or multi-layered sections of materials to achieve consistent seam quality that is free from irregular stitch pitches. Hightex 205-370BH Heavy duty triple feed sewing machine with synchronized binder for rug and carpet binding: It is vibrating binder attachment and due to this feature, a beautiful tape binding finish for heavy materials or elastic tape can smoothly and easily be performed. The Adler 205 type large Barrel shuttle hook on this industrial sewing machine is designed for sewing heavy weight materials & thick sewing threads.